The establishment of the ranch attracts many foreign and domestic tourists in the area and it is one of the attractions being reason for the development of Arba-Minch Town. Apart from raising crocodiles for the commercial purpose, the ranch releases a certain number of grow ups to lake Chamo and Abaya in order not to deplete the wild population. Currently there are almost 700 crocodiles preserved in separate place according to their age. The Ranch workers wash crocodile ponds almost every morning. Crocodiles prefer clean environment. Clean environment protects crocodiles from any diseases. Although wild crocodiles sometimes attack human beings, the crocodiles in the Ranch never attack the workers during ponds washing. 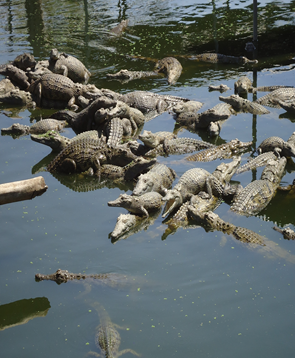 The ranch collects crocodile babies from the shore of Chamo Lake. These babies grow up in the Ranch. The crocodiles in the Ranch become used to human beings from their birth. Tourists can see harmony between crocodiles and human beings here. *Foreigner can pay entrance fee in local currency Ethiopian Birr (ETB) as well. Foreigner’s entrance fee in ETB is decided according to the rate from USD to ETB on visiting day. · Access; There is no public transportation from Arba Minch city center. Hiring bajaj (tricar in local name) or car from the city center is advisable.